A mouth divided. I’ve seen those sports plates and signs that show two rivalry teams on them with a comment about a house divided. These are great for couples where one is a fan of one of the teams, and their spouse cheers on the other. It’s fun in sports, but absolutely destructive when it comes to our speech. Read James 3:10-12. 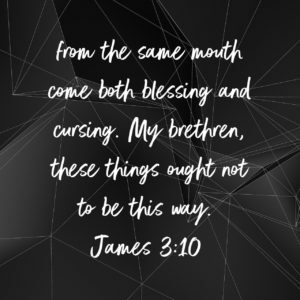 Again, James is discussing the tongue and hiw we use it each day. Do we have a mouth divided? We can’t be what God would have us be if we are constantly allowing our tongue to do whatever it wants. Do we give it limits? Do we control it? Do we ask God to control it for us? We cannot allow a mouth divided to rule and dictate how we speak to others.